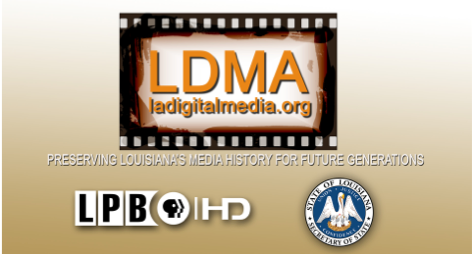 Yesterday, Louisiana Public Broadcasting and the Louisiana Secretary of State’s Office officially launched the Louisiana Digital Media Archive (LDMA), the home of the Louisiana Public Broadcasting Digital Collection and the Louisiana State Archives Multimedia Collection! This is the first project in the nation to combine the media collections of a public broadcaster and a state archives. LPB has been a participant in the AAPB since its conception, digitizing civil rights related material in the American Archive Pilot Project (AAPP), inventorying their collection during the American Archive Content Inventory Project (AACIP), and digitizing more than 500 hours as part of the most recent AAPB digitization project funded by the Corporation for Public Broadcasting. Since then, LPB archivist Leslie Bourgeois and her team have continued cataloging their archival material and have digitized more than 1,500 videos including interviews with Louisiana civil rights heroes, notable political figures, war heroes, artists and literary icons. Thousands of other videos will be added to the collection in the coming years. Next ›Crawford finishes AAPB digitization of 40,000 hours!